Eligible team must have a Win/Loss Record greater than 0.500 and opponent must have a losing record. Consistent with System #1, the W/L record is the home record if playing at home and the road record if playing on the road. Eligible team must have a greater RPI than opponent. Using the Labby System, bet each of the first two games of an eligible series. Skip game if opponent's starting pitcher is ranked in the top #25 unless eligible team's starting pitcher has a better or comparable ranking (within five spots). From May 3, 2012 to June 12, 2012, System #6 would have 68 wins and 37 losses for a 65% W/L record. Developing systems for sports betting take an insane amount of time. You should really try it sometime to appreciate how difficult it really is. It literally takes hundreds (maybe even thousands) of hours to design an effective system. So when the systems do not produce good results I have a problem sleeping at night. Thus, for my own sanity, I had to make some changes. The intent of System #1 is to find the dominant team who is currently playing better entering a new series and subsequently, chase that team to win 1 game in the first two games of the series. In the last two years, this system worked extremely well. In 2012, not so much. Although the season is young, as many subscribers remind me, it should be doing much better by now. In my opinion, and based on the feedback from many subscribers, there is nothing wrong with the criteria for System #1. A dominant team playing better right now should have an advantage. So we will continue using the same criteria as a screening tool. We're just going to add a starting pitcher tool. We identify the dominant team playing better than its opponent using the same criteria identified in System #1. Instead of blindly betting the first two games of the series, however, we will use a system to rank the quality of the pitchers. If the starting pitcher for the dominant team is better or comparable to the opponent's starting pitcher, you place a bet. Otherwise you skip the bet and wait for a game to bet in the series. It is possible, although not likely, that you will not place a bet the whole series. If the odds are higher than +150, skip the bet. If you lose your first bet, you ONLY bet one more time. If the series is more than 2 games and you win your first bet, you try for ONE MORE win. In other words, we are no longer just trying to win one game if we have a better or comparable starting pitcher. The series is over when either the dominant team or the opponent wins two games. It doesn't matter if we bet those games or not. We want to minimize disasters such as the Dodgers series earlier this month when we lost 4 consecutive bets on 3 different systems. We are still recovering from that series. How do we rank the pitchers? Go to Jeff Sagarin's Ranking System and click on either 2012 American League pitchers or 2012 National League pitchers. Jeff ranks the pitchers in 3 categories (A, B & C) depending on the number of innings pitched. I ignore any pitchers outside of the "A" category. NR (pitchers who rank outside category "A"). In general, you do not want to bet if the opponent's pitcher is in a better category. For example, if the dominant team's pitcher has a NR, you do not want to make the bet if the other pitcher has any type of ranking. As for a comparable pitcher, you would most definitely take the bet if both pitchers had a NR ranking. Advantage goes to the better team. But you would not take the bet if your pitcher is ranked #25 and the opponent is Detroit with Verlander on the mound. You do have to use your best judgment in certain cases. May 4th, NY Mets are eligible against Arizona. Game #1 starters: ARZ - Wade Miley (#11) at NYM - Dillon Gee (#49). Game #2 starters: ARZ - Pat Corbin (NR) at NYM - Johan Santana (NR). Game #3 starters: ARZ - Trevor Cahill (#25) at NYM - R.A. Dickey (#58). Game #1 does not qualify since Miley has a higher ranking than Gee (ARZ won 5-4). Game #2 qualifies and NYM won 4-3. Game #3 does not qualify (NYM won 3-1). May 18th, Texas are eligible against Houston. Game #1 starters: TEX - Neftaili Felix (#14) at HOU - Wandy Rodriguez (#14). Game #1 starters: TEX - Derek Holland (NR) at HOU - Lucas Harrell (#49). Game #1 starters: TEX - Colby Lewis (#40) at HOU - Jordan Lyles (NR). Game #1 qualifies as Texas wins 4-1. Game #2 does not qualify (HOU wins 6-5). And Game #3 qualifies as Texas wins 6-1. How did the new system do so far in 2012? System 2 is just not working so far in 2012. Maybe it turns around but we're going to take the cautious approach and watch this system from the sidelines for the time being. I will monitor this one closely. 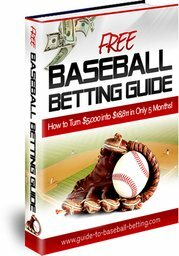 Money Management (All Systems): Replaced 2 or 3-game chase with the Labouchere System. If you're new to the Labby, check out Labouchere System. Initial bet remains at 1 unit (always bet "to win" the two outside numbers).